[334 Pages Report] The top 10 sensors market is expected grow at a significant rate during the forecast period. The base year used for this study is 2015, and the forecast period considered is between 2016 and 2022. The research methodology used to estimate and forecast the top 10 sensors market begins with obtaining data on key vendor revenues through secondary research. Some of the secondary sources used in this research include information from various journals and databases such as IEEE journals, Factiva, Hoovers, and OneSource. The vendor offerings have also been taken into consideration to determine the market segmentation. The bottom-up procedure has been employed to arrive at the overall size of the top 10 sensors market from the revenues of the key players in the market. After arriving at the overall market size, the total market has been split into several segments and subsegments which have been then verified through primary research by conducting extensive interviews with people holding key positions in the industry such as CEOs, VPs, directors, and executives. The market breakdown and data triangulation procedures have been employed to complete the overall market engineering process and arrive at the exact statistics for all segments and subsegments. The top 10 sensors ecosystem comprises manufacturers such as STMicroelectronics (Switzerland), NXP Semiconductors N.V. (Netherlands), TE Connectivity Ltd. (U.S.), Infineon Technologies AG (Germany), Texas Instruments Incorporated (U.S.), Robert Bosch GmbH (Germany), Analog Devices, Inc. (U.S.), ams AG (Austria), Honeywell International, Inc. (U.S.), Sensirion AG (Switzerland), Knowles Electronics, LLC. (U.S.), InvenSense, Inc. (U.S.), Omron Corporation (Japan), ARM Holdings Plc. (U.K.), ABB Ltd. (Switzerland), Emerson Electric Company (U.S.), Siemens AG (Germany), Broadcom Limited (U.S.), and Asahi Kasei Corporation (Japan), among others. 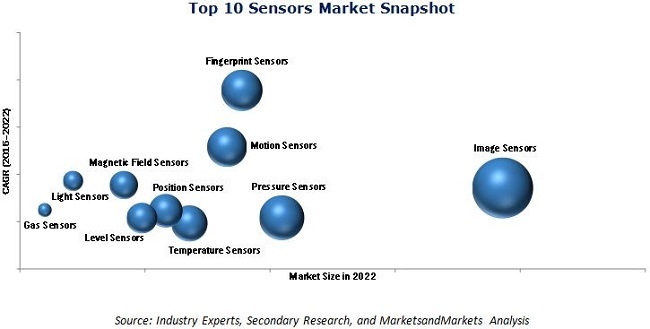 The top 10 sensors market is expected to grow at a significant rate during the forecast period. The growth of this market is propelled by the increasing advancement toward smaller, smarter, and cheaper sensors; miniaturization trend in sensors; advent of platforms such as IoT, AR, and M2M; and growing trend toward smart living among end users. This report categorizes the top 10 sensors market on the basis of type, subtype, technology, application, end-user industry, and region. The market for fingerprint sensors is expected to grow at the highest rate during the forecast period. Fingerprint sensors are expected to witness huge adoption in this application in the near future, and the consumer electronics application (which includes smartphones, laptops, tablets, smart wearable devices, and so on) is expected to hold a large share of the market. The first mobile phone with a fingerprint scanner was the Motorola Mobility (U.S.) ATRIX 4G that was launched in 2011. In 2013, Apple Inc. (U.S.) introduced iPhone 5S with fingerprint scanner, and this development is considered to be the game changer for fingerprint sensors. Other smartphone manufacturers also started implementing fingerprint scanners in their smartphones, creating ample of opportunities for fingerprint sensors. This wave is likely to drive the market for fingerprint sensors during the forecast period. Motion sensors are another sensor type which promises huge opportunities for diverse applications in the current era. The major applications of motion sensors are in consumer electronics, gaming and entertainment, automotive, healthcare, and industrial segments. The consumer electronics application holds a promising future for motion sensors with a faster growth rate than that of the overall parent market. The demand for smartphones and tablets not only helped the market grow in recent times but would also help boost the market in the next few years. Increasing adoption of technological advances such as MEMS has also played a crucial role in boosting demand for motion sensors. In 2015, APAC accounted for the largest share of the top 10 sensors market. In addition, the presence of major industries and companies is driving the demand for sensors in this region. The North American region accounted for the second-largest share of the top 10 sensors market. This report describes the drivers, restraints, opportunities, and challenges pertaining to each sensor type in the top 10 sensors market. In addition, it analyzes the current scenario and forecasts the market size till 2022. The key manufacturers in the top 10 sensors market include STMicroelectronics (Switzerland), NXP Semiconductors N.V. (Netherlands), TE Connectivity Ltd. (U.S.), Infineon Technologies AG (Germany), Texas Instruments Incorporated (U.S.), Robert Bosch GmbH (Germany), Analog Devices, Inc. (U.S.), ams AG (Austria), Honeywell International, Inc. (U.S.), Sensirion AG (Switzerland), Knowles Electronics, LLC. (U.S.), InvenSense, Inc. (U.S.), Omron Corporation (Japan), ARM Holdings Plc. (U.K.), ABB Ltd. (Switzerland), Emerson Electric Company (U.S.), Siemens AG (Germany), Broadcom Limited (U.S.), and Asahi Kasei Corporation (Japan), among others.